Normally, proxy settings are not required for home users because they are directly connected to the Internet through a modem or router. However for corporate companies that require more control of their Internet usage will have to use a proxy server to manage and share the Internet connection. The proxy server allows the administrator to see the websites that are being visited by the users and also blocking offensive or not-safe-for-work (NSFW) websites. Proxy servers can also speed up loading of webpages through internal caching by serving cached web pages to users. Another reason to connect through an anonymous proxy is to hide your real IP address. Fortunately most of the popular Internet based software such as web browsers, instant messengers and email clients support a proxy where you can enter the IP and port of the proxy server and all the Internet traffic will be routed to the proxy server. However there are some software that don’t support proxies, or the proxy authentication. Below is an example of a crawler tool called Screaming Frog SEO Spider that supports proxy, but not the authentication. If your proxy server requires a username and password to login, this tool would not work. To overcome this issue, here are 4 proxifier software that are able hook onto any program so that it can operate through a proxy even if the program doesn’t support it. FreeCap is a very old free proxifier that was last released on 2006 but seems to work on Windows 8.1 through a brief test. The first thing that you need to do for FreeCap to work under Windows 8.1 is to disable the advanced hooking technique from the settings. Click File from the menu bar and select Settings. 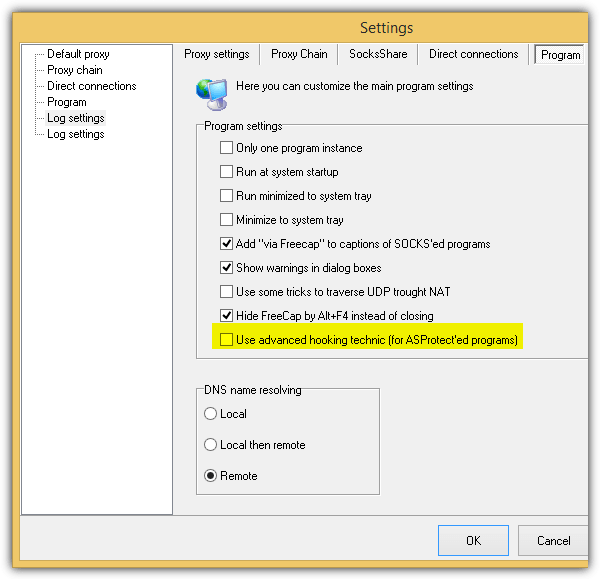 Click on the Program tab and uncheck “Use advanced hooking technique (for ASProtect’ed programs)“. Having this option enabled causes any hooked programs to crash. The next step is to add a working proxy to FreeCap so that all connections are routed through that proxy. Go to Settings again from the File menu bar, select Default proxy from the left hand tree menu, and enter the default proxy address and port. 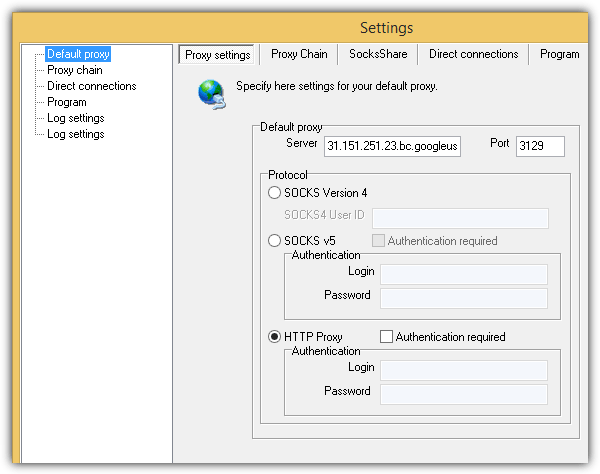 Then select the protocol of the proxy which can be either SOCKS4, SOCKS5 or HTTP proxy. If the HTTP proxy requires authentication, simply tick the checkbox, enter the login and password and click the Apply button to keep the Settings window open. Now go to the Proxy Chain tab and the proxy that you’ve just set as default will be shown on the list. Right click on the proxy and select “Check selected proxy”. This is to ensure that the proxy that you’ve entered is working. If you get a passed status for the proxy, your final step is to add the program that you would like to operate through the proxy. You can select “New Application” either from File, icon or right clicking on the main GUI. Click the browse button, select the executable file and all of the required information in the dialog box will be automatically filled. Click OK to add the application. 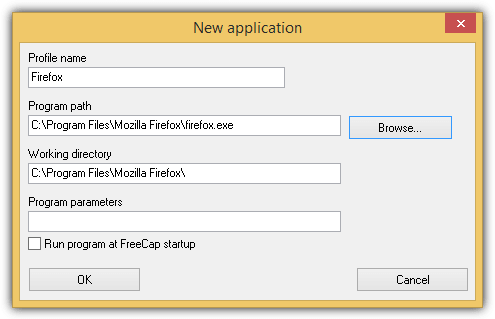 To run the program under FreeCap, either double click or click the Run icon. FreeCap automatically hooks the program and routes all Internet connection through the proxy. WideCap used to be a shareware but turned into a freeware since 2009. You will notice that many parts of WideCap resemble FreeCap but WideCap’s official website stated that it is an extended version of FreeCap but not a branch nor a new FreeCap version. 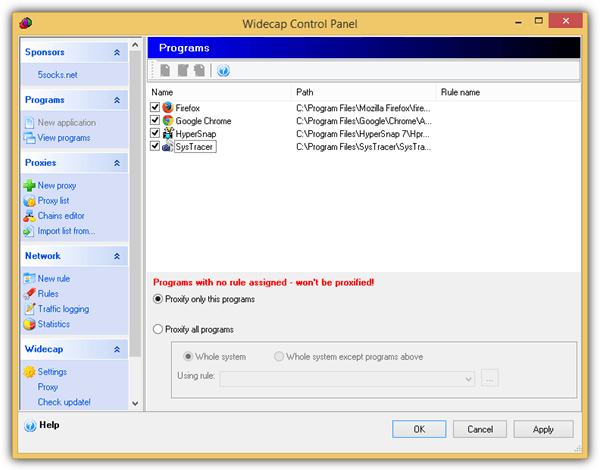 WideCap is more powerful if compared to FreeCap because you can easily proxify all programs by selecting an option and you can drag and drop a specific program that you want to proxify without manually browsing for the executable file. Only 3 steps are required to proxify an application using WideCap which is adding a proxy list, creating a rule and finally add an application with the rule assigned to it. First, click on New proxy from the left hand sidebar and add a proxy. You can add as many proxies as you want to the list. 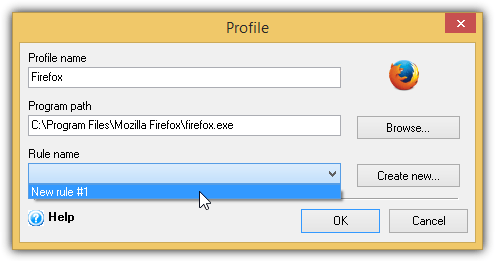 After adding a proxy, you can check if it is working by right click and select “Check selected”. Once you’re done with adding the proxies to WideCap, your next step is to create a rule. 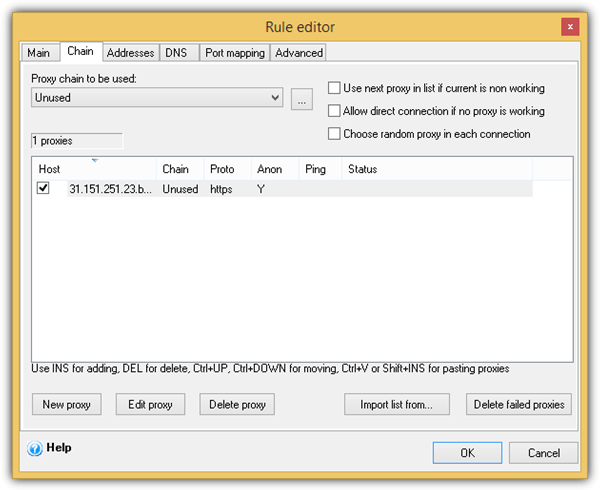 Click on New Rule, go to the Chain tab and click on the drop down menu to select “Unused” for the proxy chain to be used. The proxies that you’ve added earlier will be automatically inserted into the list. Click OK to save the rule. Finally, click on View programs and you can either select to proxify only the programs in the list or proxify all programs by selecting the radio button. For some weird reason the New Application button is disabled but you can still add it by dragging and dropping a shortcut of an executable file to the program window. Do take note that it is very important to assign a rule after adding an application or else the program won’t operate through the proxy. Double click on the added program, click on the drop down menu for Rule name and select the rule. Proxifier is a shareware available for both Windows and Mac OSX that cost $39.95 for a single user license. As you can expect from a paid software, Proxifier is more stable, up to date with new technologies, easier to use and has more features if compared to the free ones like FreeCap or WideCap. Getting Proxifier to work is as easy as just adding a working proxy to the program and the default rule will automatically route all connections through the proxy while localhost connections are bypassed and connected directly. A 31 days trial version of Proxifier is available to use for free without limitations. ProxyCap is also a shareware that cost $30 valid for 3 years of updates, unlike the Proxifier license that only entitles for minor version free updates. So far ProxyCap has three new releases in 2014 and five in 2013 unlike Proxifier which has stopped updating since November 2012. 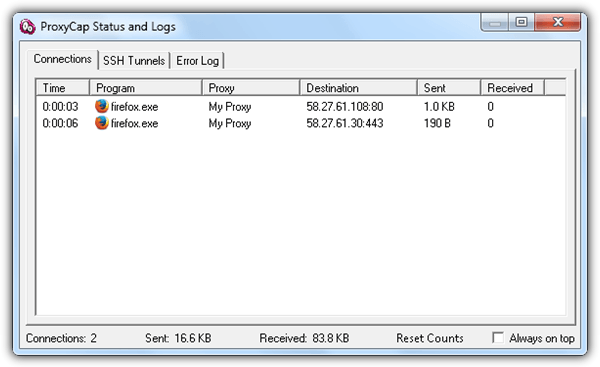 We can say that ProxyCap is currently the best proxifier tool because it supports SSH tunneling, Windows 8 metro style apps, single sign-on and centralized management. The steps to get ProxyCap working are nearly the same as the rest of the proxifier programs mentioned on this article which is adding a proxy and configure a new rule. If you’re always stuck at creating a working rule, you may have better luck with ProxyCap thanks to the step-by-step wizard based configuration. You can download the free trial ProxyCap that works for 30 days from the link below. thanks a lot, you are great. hey raymond this is the first time i am writing here. i like your blog because i get a lot of info about computer that help me (a basic computer user) a lot. thanks raymond for your detailed information…. thanks a lot, Raymond. useful info. it confused me as well. :( nice one though Ray! soon am gonna figure this things out. Great tip, I was looking for this stuff a while back and found proxifier, which works really well. Nice article. I always found that trying to find proxies was the hardest. I settled for Tor which is another good service. Nice info, Raymond!